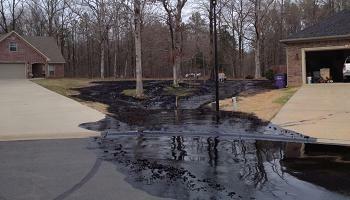 The immediate aftermath of a oil pipeline rupture in Mayflower in March 2013. A water utility company in Arkansas is urging a federal regulatory agency to uphold fines and new safety requirements for Exxon Mobil Corp. regarding a Mayflower oil spill. In a letter to the Pipeline and Hazardous Materials Safety Administration on Monday, Central Arkansas Water said Exxon Mobil doesn't understand the weight of the situation. Central Arkansas Water spokesman John Tynan says Exxon Mobil is also using various tactics to evade federal regulations. Exxon Mobil spokesman Christian Flathman declined to comment on the letter in an email to the Arkansas Democrat-Gazette. But Flathman said subsidiary Exxon Mobil Pipeline Co. doesn't have "immediate plans for submitting a remedial work plan," a necessary step to resuming the pipeline's operation. The company's Pegasus pipeline cracked open in March 2013, sending heavy crude through Mayflower's Northwoods subdivision, drainage ditches and Lake Conway cove. The government has responded the an Arkansas water utility's opposition to the proposed settlement of a lawsuit with Exxon Mobil over a 2013 oil spill in Mayflower. Wednesday's filing in federal court in Little Rock says the proposed settlement is fair, adequate, reasonable, and is consistent with the Clean Water Act. The proposed settlement submitted earlier this month would require two subsidiaries of Exxon Mobil to pay about $5 million in penalties for state and federal violations caused when the oil spilled a 22-foot portion of the Pegasus Pipeline ruptured. The federal government has asked a U.S. District Court judge to approve a final version of a consent decree with the state of Arkansas and Exxon Mobil over a 2013 oil spill in Mayflower in central Arkansas.